It’s hard to believe I start back to school this week. Our traditional Surf Camp at Beverly Beach is always the last nail in Summer’s coffin. We hang at Otter Rock, cook over a fire, they surf, I drive down to Green Salmon Coffee in Yachats, we try not to talk about work, and we always have our oyster/crab feast. 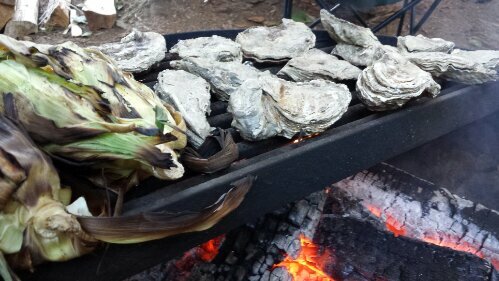 I love oysters steamed in their shells over hot coals. They pop open when they’re done, so the oyster eater simply loosens it from the shell, squeezes lemon over it, adds cocktail sauce and/or hot sauce and slurps it all down. We grilled corn and asparagus, too and melted garlic butter for the crab. We enjoyed gorgeous Hendrick’s martinis while we cooked, but when the oysters popped, so did the cava: Cristalino Brut Nature Vintage (my favorite). What a perfect night; what good friends; what a fitting farewell to a busy, healing, happy summer.